The page layout and the single questions look like they are supposed to now. CSS took more time that I expected it to. 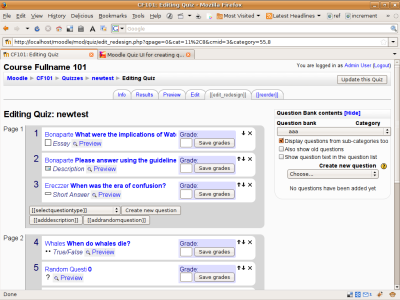 Random question layout (+listing of the questions of the category in the random question box) and question bank layout are still unimplemented, which translates to being just about one week behind schedule. Turns out that in Finland everybody (teachers) is still on holiday next week anyway so arranging usability testing would probably not have been easy, anyway. Contacted some usability test persons I recruited earlier. No reply yet. Released version 0.21 to tracker. 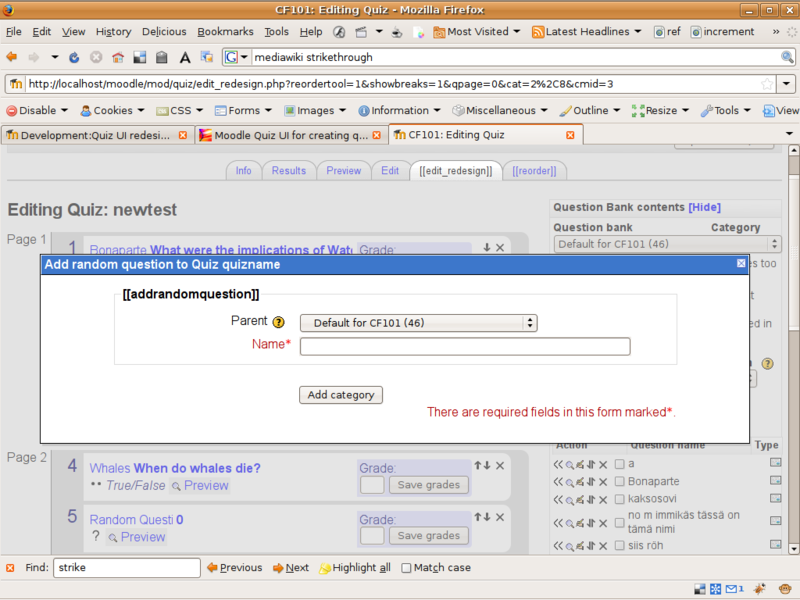 I am planning to put a demo moodle here, once most other features will have been completed. For now, you can look at the static HTML demo and if you wish, download the version in the tracker for testing. There were a couple of issues with the current quiz/questions. The most pressing one is that the Edit/Add Questions page seems to absolutely require a question category as a parameter. It would fit the workflow much better if a category could be unspecified once entering the question editing page with a new question. Then, the user would have to think about categories at least as much as to select the default category from the list. The changes required to do this seemed too dramatic so they should probably be discussed with Tim Hunt/the community. For now, we are preselecting the default category for the user. 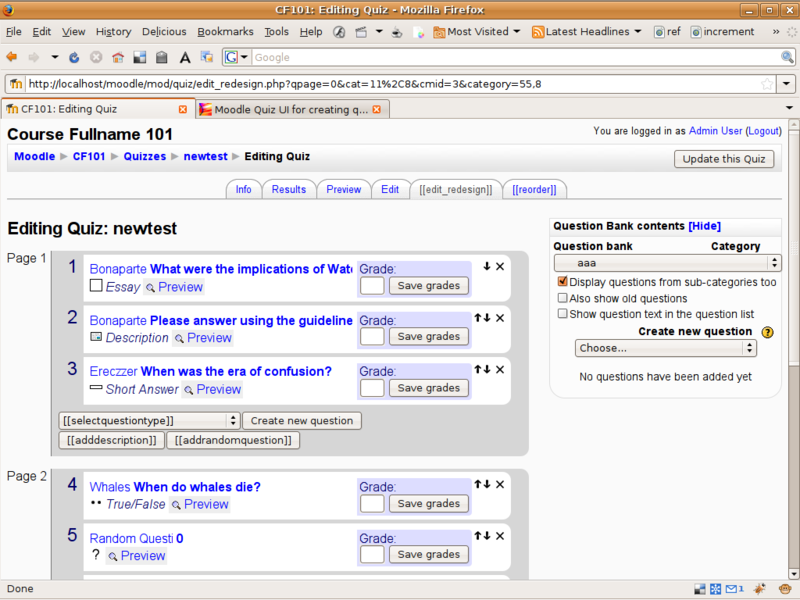 Some highlights: To get quiz work as designed, I added a new GET parameter to the question editing page, which allows specifying the name of a GET parameter to return a newly created question’s id to the page in returnurl. 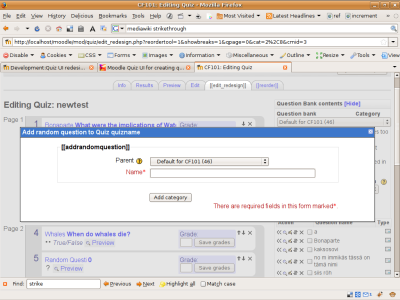 Also, the quiz editing page got a new get parameter, addonpage, for specifying the page on which to add a new question. It is somehow frustrating to use precious coding time in project management, but today I did and I am glad. Found many gems from my notes that I would have been sorry if I had found out them too late when actual development would have been done too far. Last Saturday, I published the final spec with screenshots of the tested UI. Though everybody seems to be on holiday, I got some comments about it, too. Implementation is going on in the tracker, which is the main means of following development at this point, as well as the development section of the project portal for the bleeding edge developments. Also the prototype testing report and details have been online for about a week now.